Industrial – RPP Architects & Associates Inc.
RPP Architects & Associates Inc. This project involved the architectural design of three warehouses for an industrial developer. New construction of 5,000 square feet each, CMU buildings for use as an office and warehouse space in Signal Hill. The project required substantial site work planning and engineering to access utilities. The three small warehouses are samples of inventiveness in the field of industrial design. The geometrical form was directed by the function of warehousing, the amount of cubical feet that the facility requires, and low construction cost for this type of occupancy. RPP Architects proposed an unusual entry facade adding attractiveness to this functional building. To differentiate from other local warehouses, the designers introduced a wavy roof top and strong diagonal breaks between materials in front elevation. Four major materials used in the front facade design were CMU, stucco, metal elements of doors and canopy, and glass openings. The most important part in the creative process were relationships of shapes, forms, sizes, and colors of those elements. The use of white stucco breaks up the massive 30′ high CMU wall. A split line in the middle points to two functions the facility carries: on the left, warehousing with truck access doors inserted in the CMU; on the right, human operations with offices and an entry store front door insert in the smooth stucco. The developer claims success of buildings design not only on “curb appeal,” but also on sustainable building elements, large skylights for day lighting, and a permeable driveway. Over 100 cell sites located on the roofs of high-rise buildings, historical landmarks, hotels, office buildings, shopping centers, and churches. By working with zoning administrators, architectural design review boards, and property owners, RPP Architects assisted the telecommunications site development teams in the processing of approvals for the most challenging projects. Some of them have such prominent locations as the Promenade in Santa Monica or Jonathan’s Club in Los Angeles. Corporate office, warehouse and truck parking/maintenance yard for the trucking company serving Port of Long Beach. The project required coordination with the landowner Southern California Edison Company, permitting agencies City of Long Beach and the future site user. 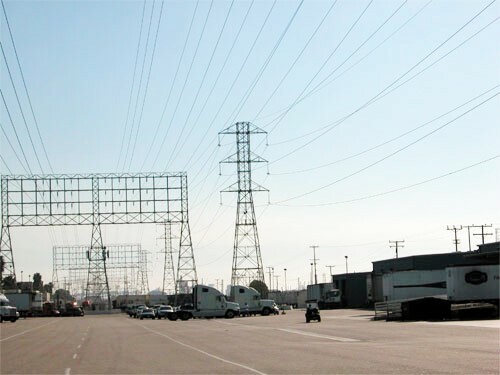 The site design and engineering met the Edison company’s strict site standards for clearance under high voltage overhead lines and the underground oil pipelines. Metal building colors complement the industrial surrounding. Spatial planning, program design, and architectural design for relocation of the recycling facility. The project required a Conditional Use Permit and Negative Declaration approval for a new business license, as well as a building code and fire code compliant design for the facility with the square footage in excess of 100,000 square feet. This building, along with the Hampton Office Building, shows RPP Architects’ great amount of flexibility in design styles, from Tudor, to drastically contemporary. Curved roof lines, the use of a metal roof, and sculptured building massing brings diversity to this industrial facility. See more examples of our commercial projects. Copyright © 2019 RPP Architects & Associates Inc. All Rights Reserved.